Specialising in bespoke Wedding and event services Apple and Bramble Events provide fantastic personalised event props and stationary. The team takes the ideas of the client and creates their dream items for their event. Be sure to contact Apple and Bramble if you’re looking for something special and a little bit different. 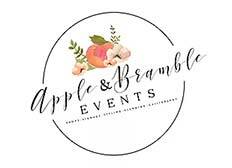 With a range of other wedding services on offer Apple and Bramble can be your one stop shop for all things wedding.